I am currently in the second week of my online Ignatian Retreat. Each morning before I begin my prayer, I ask God for a grace. Yesterday, I was feeling particularly stressed due to work and home and I asked for the grace of joy. I was blessed as I had a wonderful day full of joy, peace and laughter. During my evening Examen, I could recognize the presence of God during many of my interactions. It also got me thinking about the upcoming season of Advent, the Incarnation and the characteristics of God. Specifically, why authentic joy and peace are hallmarks of a healthy spirituality. The answer is that is the way God intended for us to be. “What most disturbs me about the argument that God cannot have a sense of humor is that the image of a humorless God goes along with the image of a God who is quick to judge, who is harsh, punishing, who demands tribute and is picky about the details, concerned with the letter of the law more than the heart. I encountered all too much of this same sort of negative theology growing up; it made me fall away from religion for a long time until I finally realized that it is not what the church actually teaches, but is merely what negative people within the church teach. It causes so much damage to people’s hearts and spirits! The argument that God is humorless not only damages people, it also is illogical. The argument makes two points: 1) humor requires surprise, and 2) God is omniscient, and so cannot be surprised. Now, I could make a case for why an omniscient God could nevertheless be surprised, but that is unnecessary, as the humorless God argument fails if its first point is false. Does humor require surprise? Of course not. Have you ever watched a sitcom? Much of the things we laugh at are absolutely predictable; there is no surprise whatsoever. My own immersion experience in the ninety-some episodes of “Gilligan’s Island” made that absolutely clear. I had watched those episodes many times growing up, and occasionally as an adult. I knew what was coming. I still laughed. And when that negative Facebook comment made me think about this last fall as I was in the midst of watching all these silly episodes, I realized that even as a kid I probably was not often surprised by the action. Humor is all about context. Surprise can be funny because of how it relates to our expectations, but the context that sets those expectations is far more important than surprise. I can laugh at what Gilligan says or does, for example, even though I know exactly what is going to happen. That’s because the episode provides the context for the kinds of things that would be funny, and the kinds of things that would not be funny. Context implies relationship. . . . Humor does not depend on surprise. It depends on an understanding of context, and context implies relationship. God is all about relationship–that’s what Christians are saying when they describe God as a Trinity. We also describe God as perfectly humble, and humility is all about relationship, too: about knowing one’s full truth in the context of all things. Furthermore, God not only is all about relationship, but in addition, as creator, God sets the context of all things, too. Humor is all about relationships in context. A perfectly humble, Trinitarian God, all about relationship and creator of all context, therefore, should have the greatest sense of humor of all! I strongly believe that the second point of David’s argument, that an omniscient God can be surprised, is also true. But that is the topic for a future discussion. Moreover, I also believe that God can be with us also during times of pain and suffering. God experiences those also and we can find joy even during these times. However, one of the greatest evangelization tools have is spreading the joy that stems from a relationship with God, especially when combined with humor. Wishing each of you a joyful and peaceful week. This entry was posted in Ignatian Spirituality, Uncategorized and tagged Advent, David Backes, Examen, God, humor, Ignatian retreat, Incarnation, Jesus, joy, laughter, teilhard de chardin, trinity. Bookmark the permalink. It made a great difference to me when I realized (sensed) that Godde indeed with us in difficult, traumatic, desperate times. I could revisit my life, seeing Godde where I had not seen her before. I’m so glad you thought of asking for it and saw that indeed it was sent to you. Thank you for the words of wisdom Claire. Much appreciated. 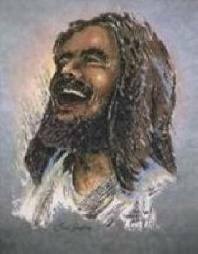 That picture of Jesus laughing is my absolute favourite for joy is a natural by-product of a close relationship with God and Jesus the Christ is in very close relationship with God the Father. Joy is one of the fruits of the Spirit (Galatians 5:22) and although humour is slightly different from joy, humour adds to the joy of our everyday lives and actually a good sense of humour empowers us to participate in the life of Christ more fully as we accept our own limitations with humility. Thank you for Teilhard de Chardin’s quote about joy. I shall add it to my list of favourite quotes. Have a joy-filled day! Thank you for the support Lynda. I wish you a joy-filled day also! Wise words Erik. Thank you for stopping by. It is hard many times for people who have lost faith to think that the Church or Scripture teach that life has to be all drudgery and sorrow and sorrow. They couldn’t be more mistaken, just read Moses exchange with God at the burning bush. Joy is what it’s all about. Thank you for visiting my blog and all the likes. I looked to send you an email but couldn’t find your email address. I do appreciate it. Ron, thank you so much for stopping by and for your comments. I absolutely agree that there are numerous scriptural references to joy in the scriptures such as the Moses and the burning bush and David dancing naked bringing the Ark of the Covenant to Jerusalem. I am sure there are numerous jokes and witicisms in the Bible that I miss due to translation and cultural issues. You have a tremendous blog and I enjoy it very much. Your conversation story is amazing and in many aspects mirrors my own journey. I really enjoy the Rembrandt portrait of the Prodigal Son on your blog. The first time I saw it was on my first Ignatian retreat and I wept as it reminded me of myself on my journey back home. Feel free to contact me any time (williamockham17@gmail.com). This is fantastic! I love how it reminds us to not just get caught up in a laundry list of “holy things” but to look and ask for joy! To laugh, and recognize God is laughing with us! Thank you so much for stopping by. You have a tremendous blog and I am impressed by your maturity and wisdom. You have infinitely more of those two characteristics than I did at your age :-). You will go far in life. Thanks William for this great blog.